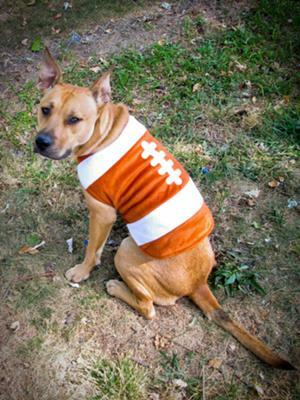 If you want to be a Blevins, you've got to be a football fan, and our dogs are no exceptions! 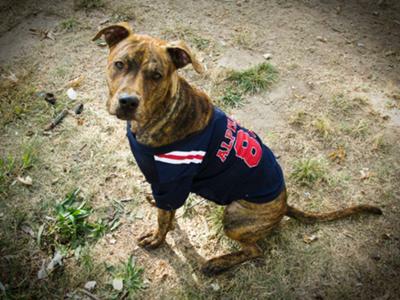 Rowan is a pit/shepherd mix, and since he was rescued at eight weeks old, he's proven himself tough as nails. His favorite game is to run at top speed and slam himself into, well, anything. Fences, doors, trees, and of course other dogs! We call him out little linebacker, though he's no tiny pup anymore at 70 pounds! He makes the perfect Football because he's tough, fearless, and has no "slow down" switch. Arwen is our "Queen B" - "B" for "Beta" because we are the Alpha (though we gave her the Alpha jersey - hopefully it doesn't go to her head!) and "Queen" because true to her pack status, she loves to tell everyone else in the pack what to do, making her the perfect Quarterback (also "QB" - see? it fits!). 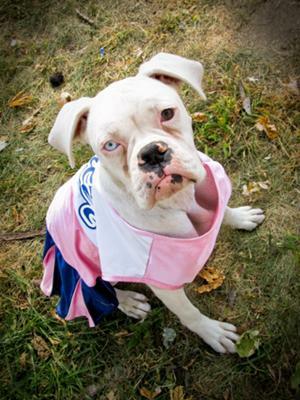 Fiona completes the team as the Cheerleader, and that role fits perfectly this sweet, mild little pit/boxer mix. When we rescued her she was severely underweight, terrified of anything that moved, and like many albino pups, completely deaf. Now she brings a sweet enthusiasm to every room she enters, and showers affection on everyone she meets. Loyal and loving, like any good cheerleader! 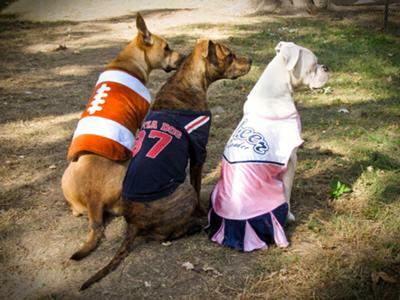 Our dogs deserve to win because they are a prime example of the power of the pack. They are all rescues and all came into our home with "issues," but their perseverance and hard work as individuals and as a pack are paying off with balance and respect. They are role models, as all athletic figures should be, and they teach us every day the values of fun, determination, and teamwork. Comments for National Pit-ball League! Great to see your dogs they are very beautiful. Happy to know that they are football fans. Please tell us about their daily activities?. I like pit bull it is one of the best breed of dogs. Thanks Natalie! We did (and still do!) work very hard, but they are worth it! It is so rewarding to see their rehabilitation progress. Arwen used to be very other-dog aggressive, and as you can see, she's a loving pack member now! Fiona is deaf, but that doesn't stop her for a second, and she's super sharp with hand signals (and a great sleeper!). We're very proud of our team! I'd be happy to talk training with you if you need help. I love to tell our stories! Wow they are beautiful...Arwen looks like my Sophie... I wish I oculd get some advice from you! AS IT SOUNDS LIKE YOU ONCE HAD YOUR HANDS FULL!